Difference between revisions of "Enabling Act of 1802"
On April 30, 1802, President Thomas Jefferson signed the Enabling Act of 1802. This act called for the admittance of Ohio as soon as possible as a state within the United States of America. On April 30, 1802, President Thomas Jefferson signed the '''Enabling Act of 1802'''. This act called for the admittance of Ohio as soon as possible as a state within the United States of America. The background of the Enabling Act was the rivalry between two different political parties in Ohio: the Federalists and the Democratic-Republicans. The Federalist Party believed that they could remain in control of government in the Northwest Territory and Ohio if new states remained relatively small. To become a state, a territory had to have sixty thousand people living within its borders. The Federalist governor of the Northwest Territory, Arthur St. Clair persuaded the Territorial Legislature to pass the Division Act in December 1801. The act asked the United States Congress to set Ohio's western boundary at the Scioto River. If the Federalists had their way, none of the areas proposed for statehood would have the required population to apply for entry to the Union. This would have allowed the Federalists to stay in control of government positions in the Northwest Territory and remain in power. The Enabling Act went from Congress to President Jefferson, a Democratic-Republican, for approval. The Enabling Act put a process in place for Congress to admit formally Ohio to the Union on February 19, 1803. Map of Ohio drawn by John Melish, ca. 1813. The land office districts in Ohio, including the Virginia Military District, the Ohio Company and the Western Reserve lands are shown on the map. Also depicted is the border between the American Indian lands in the northwest part of the state and the land settled by white pioneers. The map is hand colored and measures 9.45" x 9.45" (24 x 24 cm). Members of the Democratic-Republican Party, led by Thomas Worthington, Michael Baldwin, and Nathaniel Massie, preferred a boundary set further to the west near Cincinnati. The larger territory would have a larger population and be eligible for statehood. Statehood would end the governorship of St. Clair, who had been appointed by Federalist-leaning President George Washington. Worthington and his allies believed, correctly, that Ohioans would elect Democratic-Republicans to state and national office. In January 1802, the United States Congress rejected St. Clair's plan. The House of Representatives formed a committee to determine exactly how and when Ohio should apply for statehood. 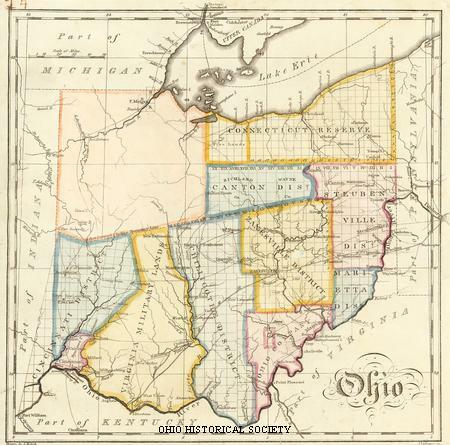 Ohio only had 45,365 citizens according to the census of 1800. However, the House committee decided that the population already had or probably would soon exceed sixty thousand. The House of Representatives and Senate, dominated by Democratic Republicans, agreed with the committee's findings and passed the Enabling Act. This legislation described Ohio's boundaries. The eastern boundary was at the Pennsylvania state line and the southern border was at the Ohio River. The western border began where the Great Miami River flows into the Ohio River and extended northward to the southern tip of Lake Michigan. The northern boundary was the border with Canada. The act also set November 1802 as the date for a constitutional convention and explained how delegates were to be elected to the convention. Once the delegates wrote a constitution and the federal government approved it, the defined territory could become a state.